Join us at the 10th Annual Papa Wheelies Bike Swap! Looking for a bicycle that doesn’t break your bank? Or do you have a dusty bike or two in the basement that you’d like to turn into cash or put toward a shiny, new bike? We’ve been doing this event for a decade. Every year seems to be better than the last. Last year we went from just Sunday to a full weekend event. 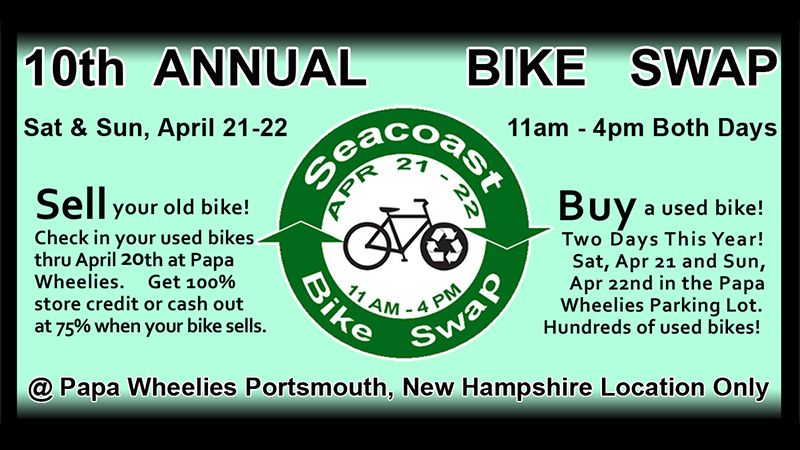 For the 10th year Papa Wheelies will be hosting coastal New Hampshire’s biggest and best used bike consignment sale. Check in your used bikes from now thru Friday, April 20 at 5pm at Papa Wheelies Bicycle Shop. Get 100% store credit or cash out at 75% when your bike sells. You name the price – we can help you figure that out if you would like help. Two days again this year! The Papa Wheelies Bicycle Shop parking lot is transformed into a used bike paradise, with a big tent and hundreds of used bikes. We open the gate at 11:00 am both Saturday, April 21 and Sunday, April 22. Come early! We accept cash or credit cards (Visa, MasterCard, American Express, Discover). Please call Papa Wheelies at 603.427.2060 or email info@papa-wheelies.com with any questions.